The use of semibatch reactors can be advantageous when a reaction has unwanted side reactions or a high heat of reaction. 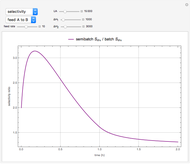 This Demonstration compares the behavior of a batch and a semibatch reactor in which a complex nonadiabatic reaction takes place. Consider the parallel reactions and , where products and are desirable and undesirable, respectively. Both reactions are irreversible, exothermic and first order in ; the first reaction that forms the desired product is second order in , while the undesired reaction is first order in . 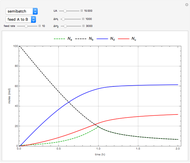 The batch reactor initially has 100 moles of each reactant, whereas the semibatch reactor initially has 100 moles of one reactant, and 100 moles of the other reactant is added at a constant rate. Both reactors have a heat exchanger inside with a constant exchanger temperature; the initial temperatures of the reactors and the feed to the semibatch reactor are the same. 1. 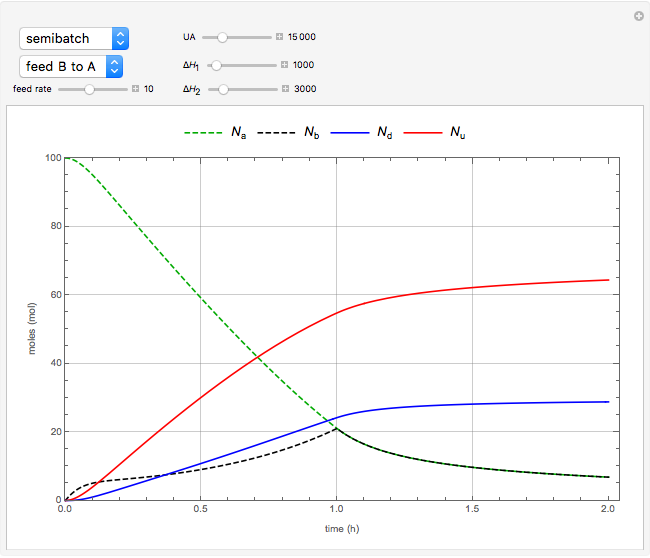 The yield (number of moles of formed) and the overall selectivity (the ratio of to ) are higher in the semibatch reactor than in the batch reactor when reactant is initially in the reactor and is fed to the reactor. Because the concentration of is high, this favors the desired reaction, which is second order in . 2. 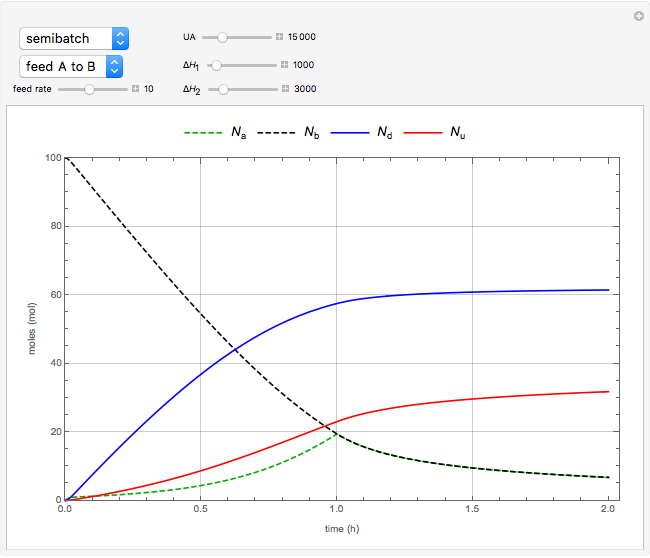 For the same reason, the overall selectivity in the semibatch reactor increases with decreasing flow rate when is fed to . 3. Temperature control is more efficient in the semibatch reactor because the reaction rate is slower. and is the selectivity of the desired product. 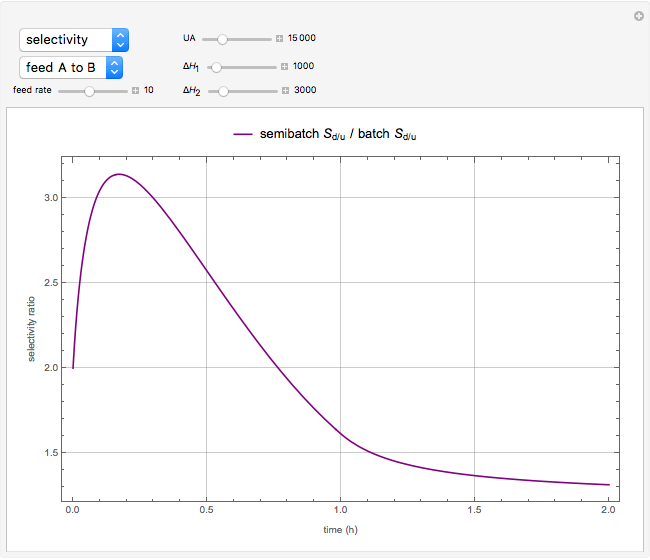 and is the initial volume of the semibatch reactor. where is the concentration of in the feed. = , = , = , and = . and , , etc. stand for heat capacities of the reactants. University of Colorado Boulder. 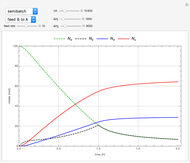 "Selectivity in a Semibatch Reactor." (Nov 8, 2017) www.colorado.edu/learncheme/kinetics/SelectivitySemibatchReactor.html. Clay Gruesbeck "Parallel Nonisothermal Reactions in Batch and Semibatch Reactors"